My project focuses on understanding how chromosomes mis-segregate in cancer cells. Some cancer cells display a phenotype called chromosomal instability (CIN), a frequent loss and gain of whole chromosomes. CIN contributes to aneuploidy in these cells, but the mechanism for chromosome mis-segregation is unknown. We are using fixed cell and live cell assays with CIN tumor cell lines HT-29, Caco-2, and MCF-7, and the non-CIN cell line HCT-116 as a control. In both live cells and fixed cells, we have seen an increase in lagging chromatids in CIN cells compared to non-CIN. We are attempting to induce chromosome mis-segregation in non-CIN cells by increasing the formation of merotelic chromosome attachments or by disrupting repair of merotelics. Fluorescence in situ hybridization of a chromosome spread from HCT116 cells. 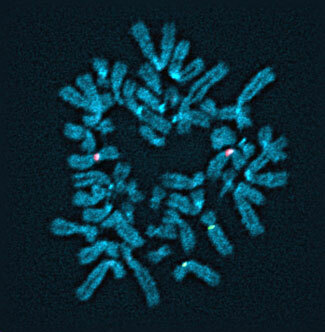 Alpha satellite probes label centromeres for chromosome 7 (green) and chromosome 8 (red).